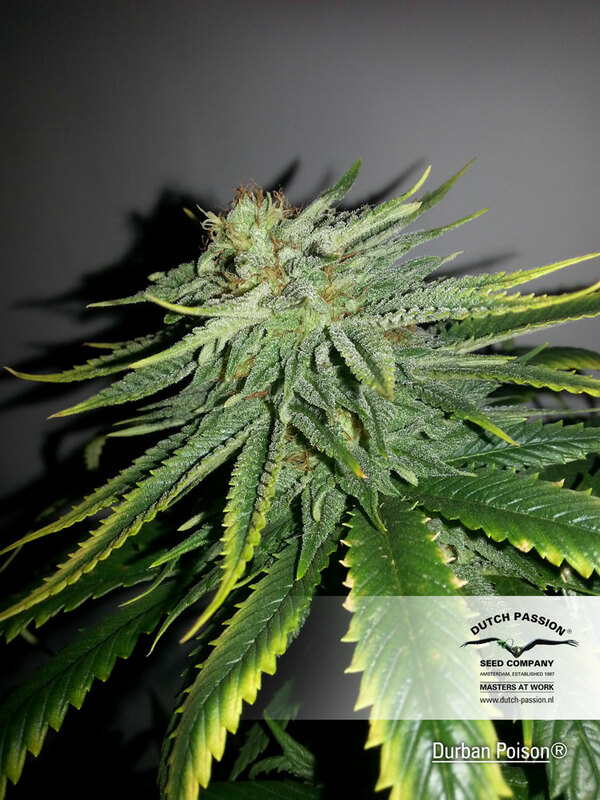 Dutch Passion original Durban Poison® is a classic outdoor and indoor variety, tough enough for cannabis outdoor growing in extreme Northern/Southern latitudes. Durban Posion seeds come originally from South Africa and was inbred over many years during the 70’s. With each generation, Durban Poison® became increasingly adapted to the windy and rainy conditions of Northern Europe. During the breeding process, some unknown indica genetics have been crossed with Durban Poison seeds. Durban Poison plant may initially show wide indica style leaves but the growth pattern allows the sativa dominance to show by the end with long blooms pierced by slim sativa-style leaves. In regard the flowering time, Durban Poison® is ready to harvest after 8-9 weeks indoors. 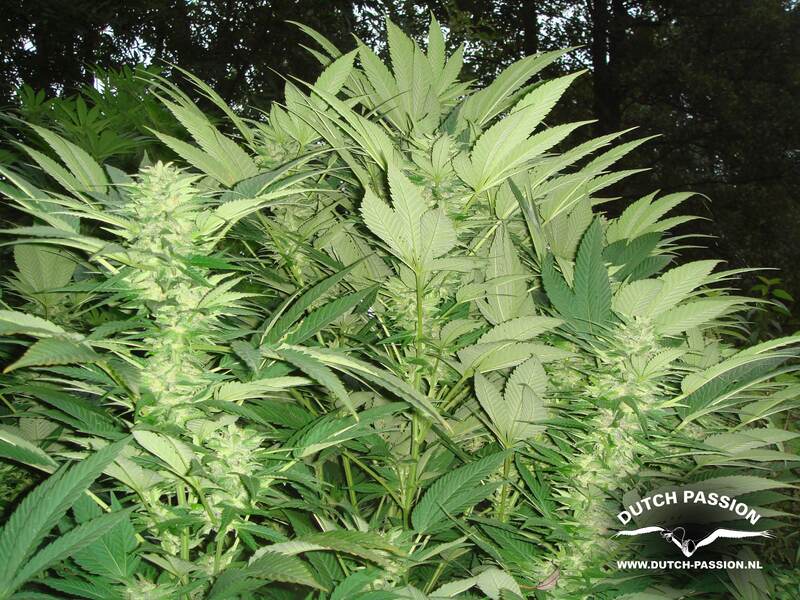 The Durban Poison plant grows until she reachs 2-3 metres tall outdoors and is harvested around the start of Autumn. With enough root space, the Durban Poison strain develops strong side branches which will carry heavy resinous blooms. The plant development, harvest appearance and energising, uplifting high are typically sativa. Durban Poison® has a spicy, hazy taste with hints of aniseed, liquorice, and cloves. The buds are often dark green and resistant to mold and pests. The Durban Poison yields are very potent and consistent. Deadcandence, 23rd March 2019. 54 degrees north is getting towards the limit for photoperiod outdoor varieties which often need good weather for the first half of October to reach harvest. One other option which guarantees a harvest is to grow autoflower seeds outdoor, any of Dutch Passion;s varieties will suffice. They grow from seed to harvest outdoors in around 100 days. Good luck! Will this strain finish well at 54 N latitude? I am not an indica fan and have no experience growing outdoors in northern climates. Any strain suggestion, please? Thanks. Michael, 10th May 2017. Sounds like a great plan for the summer! The autos are proving to be increasingly popular for a source of mid summer harvest. And the photoperiods should deliver a heavy autumn crop. Good luck and best wishes from the team! Thank you for the quick reply very professional! I grew 2 auto mazars last year outdoor and they were excellent! I'm very excited to grow your photo periods this year! I will be growing 1 durban poison (Because of your quick reply! ), and 1 hollands hope (very excited for this one!) Both in 15 gallon pots. I will also be growing 2 autos again, durban auto & auto cookies, I'm sure they'll perform just as good as your excellent auto maker. Michael, 9th May 2017. Grown indoors, you would expect to see THC around 20% but CBD would typically be 1% or below, this is not a CBD rich variety. Grown outdoors, THC could be lower if conditions are not optimum, but its difficult to guess what THC levels would be from an outdoor grow due to the large variations in conditions. What are the thc and cbd levels of this plant on average? Having grown up in SA, I love me some DP. The best form is when all the pestles go red, they call it Rooi baard (red beard), it is almost treated as a strain on its own. Very appreciated strain! The most vigorous and easy to grow strain I have ever encounter. Grows squat with fat Indica leaves initially and progresses to a more classical Sativa appearance as it matures. Lovely licorice or anise aroma during flower but mine cured to a more lemon aroma. High is admittedly mild, with an initial uplifting burst of energy followed by relaxation and some sedative effect, but relatively long lasting. The first time I tried it with a vaporiser had me busting kung-fu moves in the air! It's a great strain when you want to take the edge off things but still lets you go out and face the outside world without feeling self-conscious or paranoid. You can see my grow currently image 10 of 23. Hi, Love Durban by Dutch Passion, I Have a question, Has The strain been reworked? (2013-2016) Because I grew some out about 3 months ago and the buds seem twice as strong then I remember back in 2000? Good work DP. Is is better to flower from seed with sativa plants? As I always seem to get lots of stretch. Living in Jamaica 5 years now. The smoke here looks good but the strength is weak. I want to try and grow my own bud outdoors. what would you recommend? Is it too late 'June' to grow this in cold wet Ireland.? Is south,& south west facing best to grow outdoors? Very good choice for temerate climate, one of my favourite ones. I grow her for last four years and there never was a problem with mold or any disease. Easy recomended! I use Durban Poison for depression/ macular degeneration (dry type). I find that it gives you an up feeling that lasts a long time and cheers you up. I know this sounds unbelievable, but I swear my vision is much better and my concentration is better after medicating with it. One other important aspect is that I have no lingering after effects after indulging in this medicinal herb. I had some that was grown in hydro and indoors, a very nice smoke indeed with a wonderfull aroma when ready. Recommended. my mate says Durban Poison will grow outdoors in the UK but I ran her in my greenhouse to be safe. She turned out to be the best smoke I have had in years, a real head slam. I think greenhouse grown weed gets an extra 'kick' from the sun and Durban delivers it. You always hear UK growers opting for Frisian Dew but I will deffo be growing this again.